Which of These 3 Insurance Brokers Is the Best Buy? These three insurance brokers are coming off huge years, so I'll dig into which company is the best long-term investment. Wouldn't it be nice to get a piece of the insurance industry without worrying about the company losing money due to bad underwriting? Welcome to the wonderful world of insurance brokering. Among other things, these companies act as intermediaries between clients and insurance carriers, and in the process, earn commissions and fees. Marsh & McLennan (NYSE:MMC), Willis Group (UNKNOWN:WSH.DL), and Aon (NYSE:AON) are three of the largest insurance brokers. Today, by looking at three important factors, I'll dig into which of these three companies, if any, is the best investment. "I consider each investment based on concept and revenue" Daymond John. While the companies vary, each has proven its ability to grow and maintain revenue streams. Aon has dominated in total revenue growth since 2008, and Willis Group is a strong but distance second. 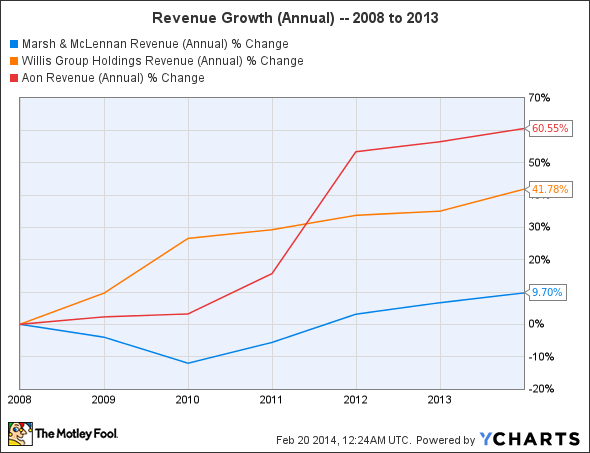 In comparison, while Marsh & McLennan looks almost comatose, it leads the three companies in total revenue. 2013 was a strong year for all three companies. Marsh & McLennan and Aon grew total revenue by 4% and 3% respectively. Willis Group looked steady throughout with 5% total revenue growth. When compared to regular insurers, revenue is a much more useful indicator for insurance brokers. Insurers will eventually have to pay back a portion of it takes in through customer claims; insurance brokers, on the other hand, don't have to worry about that: after paying costs, brokers earn all of what it takes in. Operating margin represents how much revenue is left after paying variable costs of production. All things being equal, the larger the percentage the better. Operating margin can be affected by a number of factors. For instance, a more competitive landscape could force brokers to lower prices which would, in turn, shrink operating margin. Higher variable costs can also affect margin. Such was the case for Willis Group in 2012. In the process of changing management it took a large loss in goodwill, and paid out a significant amount in cash bonuses and retention awards. For most industries there's one or two metrics that investors and management look to for signs of progress. For example, an insurer that prides itself on strong underwriting will highlight the combined ratio. Operating margin is one such metric for brokers because it shows how well the company is able to charge high rates while keeping variable costs low. The companies that can accomplish this will more easily pay fixed costs, and over the long-term be more profitable. Investors should hope to see these numbers stable or growing. Though, in tough environments shrinking margins are often unavoidable. By comparing similar businesses, you can get a better idea if its an industry trend or something unique to the company. Companies with strong cash positions are better equipped to buy back shares and pay dividends, as well as make strategic acquisitions. In particular, acquisitions are essential for these companies to maintain long-term growth. 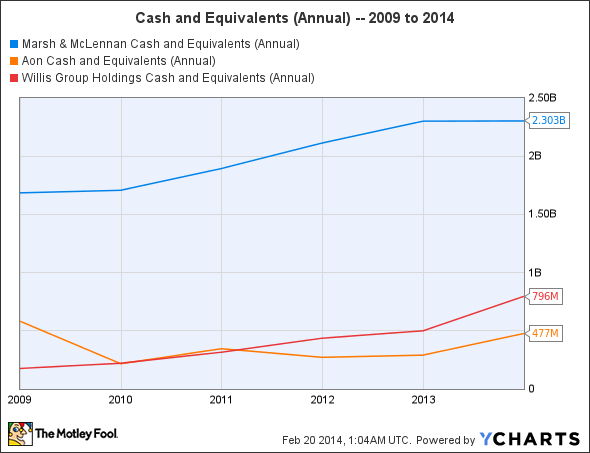 Cash and cash equivalents (CCE) are an indicator of the amount of liquid assets a company controls. As mentioned early, having a strong cash position gives a company opportunity. If large amounts of cash remain on the balance sheet, however, it could indicate that it's not taking advantage of that opportunity. This is why it's equally important to understand how each company is utilizing its CCE. Marsh & McLennan bought back over 13 million shares in 2013, as well as making a large acquisition in Barney & Barney. According to BusinessWire, Barney & Barney is worth an extra $100 million in annual revenue. Willis Group strengthened its cash flow in 2013. To which, the company suggested, "Based on that performance, and confidence in our strategy, we are increasing our dividend by 7%." Aon was the leader in share buybacks in 2013. The company repurchased nearly 17 million Class A Ordinary Shares for approximately $1 billion. Which company is the best buy? While none of the three stocks look particularly cheap right now, at the current valuations, I'm favoring Marsh & McLennan, Aon, and Willis Group in that order. I believe mergers and acquisitions will continue to be a major theme in the brokerage industry, and Aon and Marsh & McLennan have the strongest market positions. With that said, I'll be keeping a close on how clear and actionable the new direction is for Willis Group. If it's something investors can get behind, it may catapult them to the top of the list.